I have a really bad problem about being last minute for everything I do, and that includes my clothing choices often times. I always do these last minute decisions about my outfit before I go out the door, and I always end up regretting them. Take this outfit for example. It was perfectly fine right before I was going to leave and then I felt like it was missing something, so I put a hat on which doesn't go with the style of this outfit at all. Then I thought I needed lipstick and picked out a deep purple and wasn't thinking that I was wearing green...so now I'm the colors of Barney the dinosaur? Wish I would have just listened to my gut instinct and left my outfit as it was and I would have liked it a lot better. Sigh, I'll learn someday I suppose. Oh dear! My last minuteness equated to having to run for my train in the morning which is a mile away! I'm exhausted by the time I reach it and then have the whole day to go!! Oh and having to stay up late getting things done! I LOVE those cat tights! I totally couldn't pull those off, but you rock them, girl! As for last minute, whatever you are doing, whatever process you apply to fashion choices, it is very much working so keep it up :) Hope you are doing great! You rock! Lauren! You look so cute, don't be so hard on yourself. 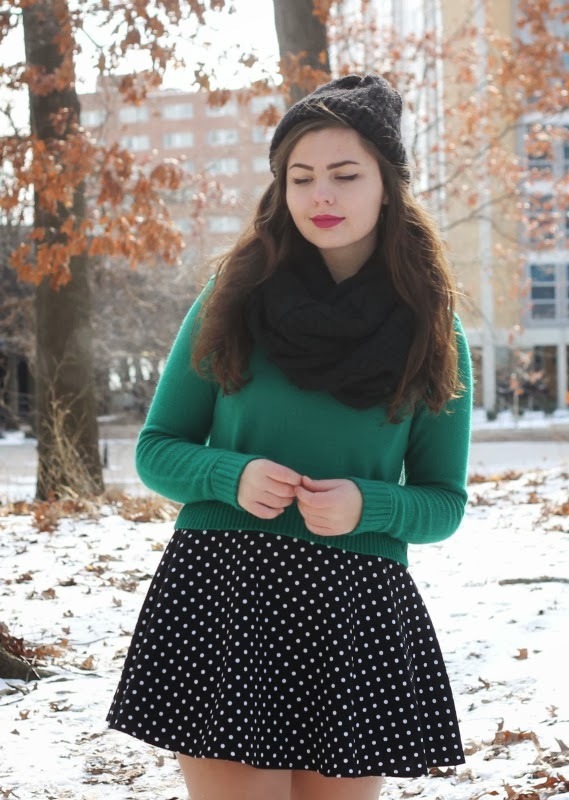 I like the beanie with the outfit, and the lips are gorgeous. It adds a tiny bit of edge to the look! Hope you are doing well and enjoy your weekend. I actually like this one, minus the cat tights lol. I love pairing purple with green (in certain ways of course), Barney knew what's up! I definitely didn't get Barney from this outfit. This shade of lipstick looks awesome with green! I love how you wore that pinafore dress as a skirt here and those cat tights are the cutest ever. I actually LOVE this hat with this outfit - adds a hint of punk to it, which I like! And that skirt is also so adorable!